The legendary musician was calling to express his support of her efforts to preserve the legacy of her late father, Bob Moog, who invented the first commercially available electronic synthesizer. A WNC resident for nearly 30 years and professor at UNC Asheville from 1989 to ’92, he helped shape the history of music, impacting generations of performers. From his early career at age 19 selling theremin kits in 1954, to the invention of the Moog modular synthesizer a decade later, to all the mini electronic keyboard variations currently built at Moog Music (an Asheville-based company he built and later sold) musicians and sound techs the world over know his name. You could call Michelle a music promoter, but not in the traditional sense. She’s the founder and executive director of the grassroots Bob Moog Foundation. These days, she finds herself sharing her plans with a host of musicians, including ’70s rockers Keith Emerson, Rick Wakeman of Yes, jazz legends Herbie Hancock and Chick Corea, and contemporary artists such as Smashing Pumpkins frontman Billy Corgan and The Beastie Boys. Since her father’s passing in 2005, Michelle’s mission has been to share his work through educational outreach and preservation. But for someone who majored in political science, aspired to attend law school, and wound up owning a boutique, it wasn’t a position she ever thought she’d find herself in. In 1978, the Moog family moved from Ithaca, New York, to Leicester, where Bob built a 16-sided roundhouse on a large plot of virgin land. “We got to spend some really good time with my dad then—lots of nights around the campfire, reading, and doing stuff with the construction of the house,” recalls Michelle, who was 10 when they relocated. Bob also spent a lot of time in his workshop, tinkering with instruments. Musicians would call on him or occasionally visit for repairs. “I realized at a pretty young age what a unique and deep presence he had,” she says. But she wouldn’t fully understand his esteem in the music world until much later in life; following college and a four-year stint in Senegal, where she met her husband, and then eight years running Amoire, a boutique in Asheville. Bob’s death changed everything. “We found out about the tumor on April 29, and by July he was bedridden,” Michelle says. As a way for Bob to stay in touch with 40 friends around the world, his son, Matthew, set up a website that allowed him to exchange messages and post updates. Despite efforts to protect his privacy, word about the website and his condition got out. And in the six weeks before he passed, more than 80,000 people logged on, posting tributes and sharing stories of how he’d changed lives and inspired creativity. “Me, my siblings, and my step-mother, we were all blown away,” she says. “I don’t think any of us realized the extent, the depth, and breadth to which he impacted people’s lives. It was really a time of intellectual reckoning for me; trying to figure out how this cool, geeky, eccentric dad who I grew up with was also this other guy named Bob Moog, who meant so many profound things to people tens of thousands of miles away. We all realized that he had this incredible legacy.” It was a legacy she recognized needed to be preserved. 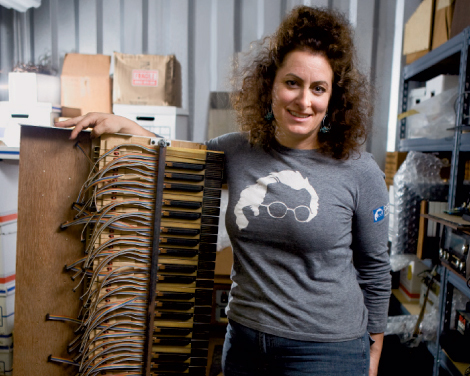 Michelle launched the Bob Moog Foundation in 2006 with no financial backing and the goal of influencing future generations through electronic music and the science behind her father’s inventions. And she knew exactly where to begin. Bob’s workshop, a nonclimate-controlled metal structure, held what the family thought to be about 100 boxes containing his life’s work: drawings and schematics, vintage instruments, photographs, and articles. There turned out to be about five times that amount of material. “It was very moldy,” says Michelle. “There were snake skins and mouse droppings…but for the most part, things were in good condition.” The reel-to-reel tapes—Bob’s demo recordings for his inventions—suffered the worst. With guidance from sound and image archivist Doug Babb, and two grants totaling nearly $25,000 from the GRAMMY Foundation, restoration is underway. But the process is slow and costly, and only 40 of the 300 reel-to-reels are expected to be finished by July. However, many of the items are already inspiring audiences. Nearly 22,000 people visited an eight-month exhibit of the restored materials at the Museum of Making Music in Carlsbad, California. Other museums, including the Rock and Roll Hall of Fame and The GRAMMY Museum, are interested in hosting exhibits. Progress is also being made toward the foundation’s educational goal. Last year, a pilot program sent Moog instruments, including an oscilloscope that visualizes waveforms, into several Asheville schools to teach kids about vibrations and circuitry. “Even something as simple as that visual connection to what kids are hearing is an important way to get them to start thinking about very elementary physics,” says Michelle. UNC Asheville physics Professor Mike Ruiz is helping develop curriculum for kindergarteners through eighth-grade students, and with the assistance of Volunteer Creative Director Dave Hamilton, it will be launched in select Asheville schools this fall. Michelle hopes the program will eventually be available to schools nationwide. The foundation’s hallmark project is a Moogseum in Asheville, which will house Bob’s archives, as well as interactive exhibits and a performance space. But that massive undertaking is in the distant future. Master planning and feasibility studies are in order first, and a large amount of money must be raised for the project’s completion. In May, a Minimoogseum, a large display case housed at The Orange Peel in downtown, holds the first rotating installation of memorabilia.